It takes a special talent to style a runway show for a major fashion week. Yes, the new collection of clothing may take center stage, but a stylist is a person who helps showcase how to wear it. They're also the ones who know how to make the clothes look great walking down a runway (or street) or captured forever in a photograph. That's the kind of styling advice we can get behind, too. With this in mind, we asked Ronald Burton III to share some of his tricks of the trade. Fresh off having styled Claudia Li's first runway show this New York Fashion Week, he told us a few of his favorite ways to piece outfits together that always look as impressive in a photo as they do in the flesh. What's more, Burton's tips also pair unexpected pieces that you may have not considered could "go" together. Below, take a look at the tips we're stealing for our own wardrobes ASAP. 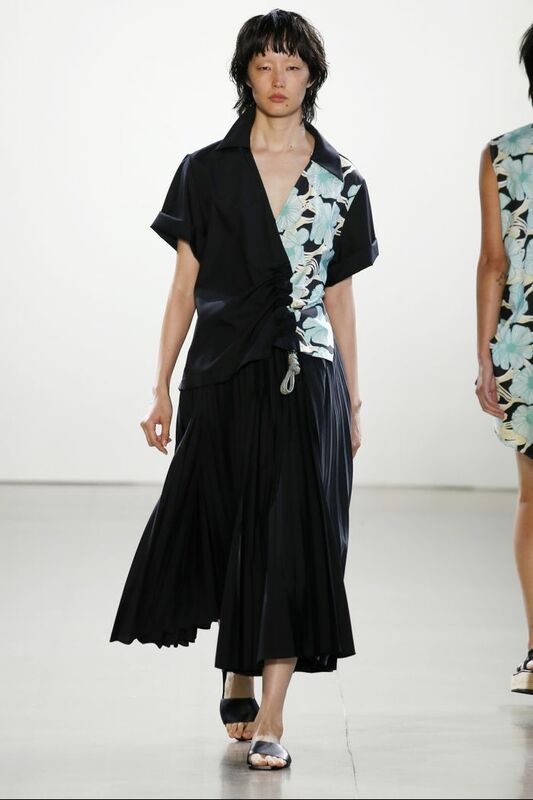 We love this tied-up button-down over a most demure skirt, as well. Not into denim? This structured jacket–and-lace pairing also feels equal parts delicate and strong. Try this trick with all manner of jackets: trenches, anoraks, blazers, duster coats, etc. Live and die by your black ankle boots? You'll be all about these 17 black-ankle-boot outfits this fall.